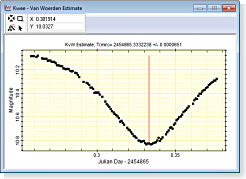 Mira Pro x64 and Mira Pro Ultimate Edition include an implementation of the Kwee ‒ van Woerden Algorithm for calculating the time of minimum from a set of unequally spaced data. This is a professional research tool used for study of variable stars, minor planets, etc. The calculation of the 1-sigma uncertainty in time of minimum is one feature of the Kwee ‒ van Woerden algorithm that distinguishes it from standard numerical minimum-finding techniques. Mira supports data import by manual entry or pasting in multi-column data. Supported format include TXT, CSV, and plain text with user-specified column separators. 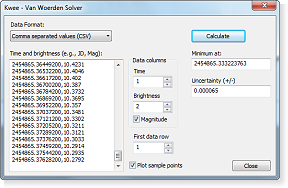 Solver dialog showing data imported from CSV (Comma Separated Value) format. The time of minimum and 1-sigma uncertainty are listed on the right side of the dialog. Check the "Plot Sample Points" box to have the input data and calculated time of minimum displayed in a Plot Window (see below). 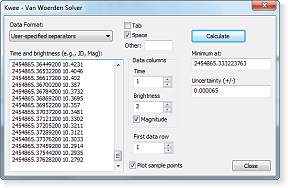 Solver dialog showing data imported from text format with user-specified column separators.